Feel That Your Child Is Falling Behind At School? 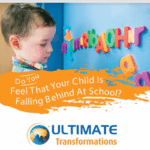 Ultimate Transformations is an Educational Consultancy, Coaching and Training Organisation committed to inspiring students with learning difficulties to rediscover the joy of learning and be successful lifelong learners. Our coaching is deeper in scope than tutoring. The trainings help to understand the child’s difficulties and provide strategies to best support them on their journey to success. Each session is of one hour duration, available during school and after school hours. We also provide coaching during term holidays (maximum of four students in a group session).